Kelly Whitmore, chairwoman of the Atlantic States Fisheries Commission's Northern Shrimp Technical Committee, describes the state of the shrimp stock in the Gulf of Maine to the larger commission's northern shrimp advisory panel Tuesday morning in a Portland meeting. Whitmore said the committee believes the stock has collapsed and recommended a moratorium on shrimp fishing. Professional pickers can shell up to 20 pounds of Maine shrimp an hour. Amateurs need Cajun music and a beer to distract them from the prickly work. Sweet, tender meat is the reward. PORTLAND, Maine — Northeastern regulators shut down the Gulf of Maine shrimp fishery for the first time in 35 years Tuesday afternoon, worried by reports of what researchers called a fully “collapsed” stock that could be driven to near extinction with any 2014 catch. 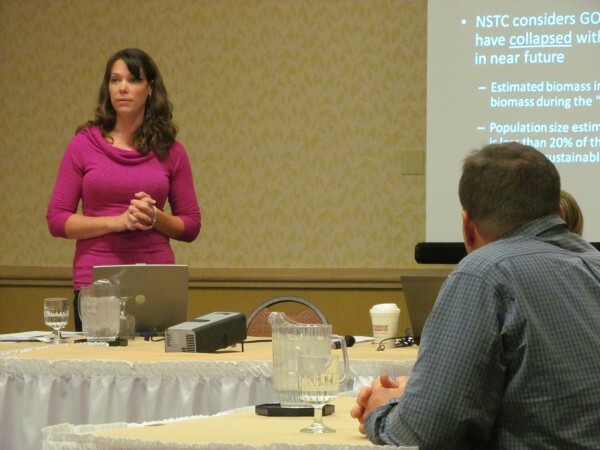 The Atlantic States Marine Fisheries Commission’s Northern Shrimp Section, a subset of the multistate agency that oversees North Atlantic shrimp fisheries, met Tuesday in Portland to set guidelines for the coming season. The 11-person section decided by consensus to wipe out the 2014 season, denying a 175-metric-ton catch limit recommended by its Northern Shrimp Advisory Board. The panel made its decision against a backdrop of plummeting shrimp populations off the coast of Maine, according to researchers with the commission’s Northern Shrimp Technical Committee. The committee also urged regulators to shut down the shrimp fishery during the 2013 season, but the section instead allowed fishing to continue under a lower overall catch cap of 625 metric tons — or 1.4 million pounds. 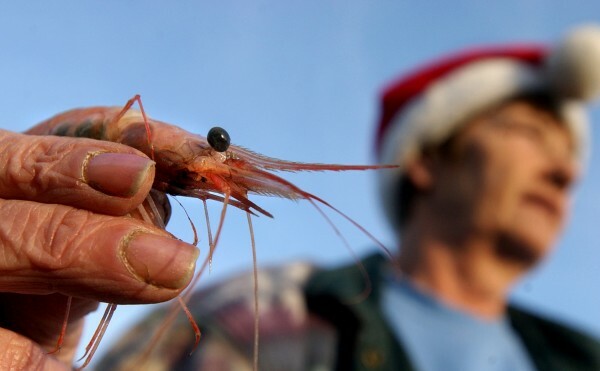 That represented a 72 percent decrease from the allowable catch set for the previous year, and shrimpers ultimately caught only 307 metric tons, or about 677,000 pounds. That compares with more than 6,000 metric tons caught each year in 2011 and 2012. But 2013’s extremely limited catch did not provide enough relief for the shrimp stock to bounce back for the 2014 season, Whitmore said Tuesday. Of the 307 metric tons of shrimp caught in Maine, New Hampshire and Massachusetts in 2013, Maine shrimpers hauled in 268 metric tons. By a large margin, Maine shrimpers will be most affected by the section’s guidelines. With supply limited, the price shrimpers have received for their catch has ballooned from 54 cents per pound in 2010 to $1.81 per pound in 2013. In 1978, regulators declared a moratorium on shrimp fishing after annual catches of more than 11,000 metric tons dropped off to 400 metric tons in 1977. From 1979 until 1987, overall yearly catches steadily rebounded to more than 5,000 metric tons, and in 1996, reached 9,500 metric tons, the greatest amount in nearly a quarter-century. But in recent years, the shrimp population in the Gulf of Maine experienced another precipitous decline, Whitmore said, and at least another year off from being fished is needed to give the species a chance to recuperate. In addition to fishing, Whitmore acknowledged that warmer water temperatures — driving away the phytoplankton that shrimp eat and attracting more predators such as hake — in the gulf have contributed to the depletion of the shrimp stock. “We do understand that fishing is not the only source of mortality and that’s not the only reason the stock is so low now,” she said. Marshall Alexander, a member of the section advisory panel from Biddeford, said he believes the decreased shrimp stock is just a low point in a regular cycle. “I have a real problem with shutting the industry right down, because of all the harm it does with such little benefit,” Alexander said. Others theorized that shrimp populations simply shifted to colder waters north and east of the Gulf of Maine, in the same way that species such as hake — formerly found in greater abundance in southern New England waters — have in recent years migrated into the gulf. Rob Bauer, head of Southwest Harbor’s Beal’s Lobster Pier, said coastal Maine restaurants count on fresh Maine shrimp as a significant attraction for tourists. “I think there’s still some doubt about the science,” Bauer told regulators and their advisers. “A small fishery for those of us Down East is better than no fishery. It meant that Bar Harbor restaurants could advertise Maine shrimp.